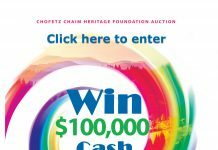 Last night, I attended an asifa for a wonderful cause publicized here on Matzav.com. In attendance were hundreds of people who came for no reason other than to be inspired by the words of chizuk of the distinguished rabbonim who spoke and to contribute to the worthy cause for which the gathering was held, a cause whose importance was discussed here on Matzav. Also at the event were numerous young boys – I would say in the age range of 11 to 12 – who had come perhaps just to see what was going on, but also to take pictures of the rabbonim on the dais and the guest speaker from Eretz Yisroel. As the program began, there were some boys hanging around the area in front of the dais. They were asked to stand to the side so as not to serve as a distraction to the attendees or the speakers. But what happened next is what left me appalled. Apparently, not happy with the boys still standing at the front of the hall near the dais, and occasionally inching a bit closer to get a picture, someone had the boys thrown out. Yes, I say “thrown out,” because they were literally dumped and physically pushed out of the hall unceremoniously like they were vermin or worse. I met one of the boys outside afterwards and he was shaken up. He couldn’t continue. He was so hurt. As I left the hall after talking to this boy, I thought about it. You know, I said to myself, he has a point. 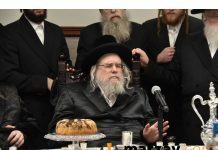 No one has any business yelling or embarrassing our precious tinokos shel bais rabbon, especially when they are involved in an innocent – yes innocent – pursuit of taking pictures of rabbonim or roshei yeshiva. We should be gratified that they are running after our Torah leaders, even if it is for the mundane reason of taking a photo. If they are disturbing, they should have been spoken to between the drashos (there was ample opportunity). But to shame them in the middle of a speech, in front of everyone, as if they are worthless – which is the way it came out – is a true shandeh. Do we want to drive these young boys away? If we treat them like they were treated in this instance, should we be surprised when they embrace the at-risk lifestyle? It’s great to be macho and to allegedly be acting on behalf of the greater good by chasing kids out of events and away from rabbonim. But we might just be chasing them away from Yiddishkeit too. You think that’s an overstatement? Think about again. It’s not. It reminds me of a dinner, where the organizers had two Frum people thrown out by security for handing out literature about Joe Lieberman’s stance on toeivah marriage. I think this is pure loshon hara. If you are that appalled, go to the rabbonim and ask them about it. Don’t give people on websites fuel to further question meetings of daas Torah. We already live in a society where everyone thinks they know more than the rabbonim. There is no toeles is airing your comments here. Anything can be taken out of context. I am the first to stick up for children as I teach preschool but be careful whom you are denigrating. Unless it’s possible the rabbonim knew nothing of it- they were on the dais. If you read the above comments, you’ll see I’m right! Geferlicha maysa. Rachmonos on the kids. The adult who pushed them out needs a little seichel. Talking nicely to children will always get you somewhere. Let this adult apologize. Then, THAT will be a real lesson for children. I was there and the rabbonim knew NOTHING about it at all. They had nothing to do with it. In fact, I would say that the rabbonim, INCLUDING RAV DON SEGAL, would have said that the boys should be allowed to stay! The person who threw them out did so on his OWN. He obviously decided that he knows better. thats what happens from a night set up for hock by a bunch of hockers.you know who you are. a. No one deserves to be embarrassed no matter what. Not only Tinokos shel bais rabbon. b. the boy had a point. There should have been a table set up or a place for them to be. I think this is just exposing a problem that children have nothing to fill their time with. It’s up to us to find them constructive things to do. It serves those boys right. How dare they stand in such a holy mai’med with colored shirts. #10 Zalman I hope your kidding!! I hope you don’t teach hilchos loshon hora to your preschoolers. Wow!Any names mentioned in the article? Any finger-pointing? After you learn the halachos – get real. to #12: Do you learn hilchos loshon hara? People knew which rabbonim were at that asifa and the first few comments seemed to point a finger at the whole asifa. If you’d learn loshon hara, even pointing finger at a group is considered loshon hara. People like to find fault with rabbonim. Just be careful. People who commented here knew exactly which asifa it was and it wasn’t until comment #6, that someone mentioned that the rabbonim on the dais knew nothing of it.